It was a busy spring break for the North Dakota State track and field teams, as the indoor season closed and the outdoor started. The break was especially busy for a pair of seniors, as Alex Renner and Rose Jackson took part in the NCAA Indoor Championships in Texas. It was a banner day for Jackson, the Summit League pentathlon champion. She recorded career bests in three of the five events to finish eighth for All-American honors. On her way, she smashed Whitney Carlson’s school record by 127 points, finishing with 4,142 points. Jackson was second of the 16 pentathlon competitors in the shot put, with a throw of 41-11.25. Her fourth place in the long jump helped set up a shot in the 800m for the final first-team All-American spot. On the men’s side, Renner became the second man to earn multiple Division I All-American honors in school history. He joined Matti Mortimore in the club with his 11th place finish. His throw of 61-03.00 put him just short of the top nine, who moved on to finals. 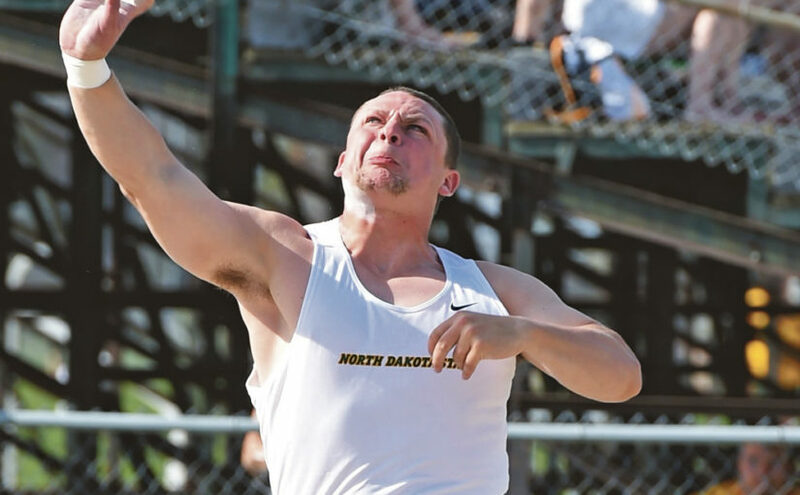 The mark also means that Renner now owns the top 26 indoor shot put throws in NDSU history. With the indoor season finished, attention turned to outdoor starting with the Baldy Castillo Invitational at Arizona State. The meet started with a bang, as Steffan Stroh got off to a strong start in the hammer throw. The junior moved to No. 2 all-time for NDSU with a throw of 205-11 in the opening meet of the year. The hottest start of all came from Mortimore, as the senior improved his school record in the javelin. The throw of 253-1 not only tops the charts at NDSU, but leads all the NCAA early in the season. Not only did Mortimore’s throw win him the event, it also earned him U.S. Track & Field and Cross Country Association’s National Athlete of the Week honors. Junior Austin Schmidt and freshman Brendan Artley, in his first collegiate meet, rounded off the all-Bison podium in the javelin. Renner also ranks highly in the nation after the meet, as his throw of 62-03.25 won the event and is second in the nation. For the women, NDSU was led by Katelyn Weimerskirch. The senior won the discus with a throw of 174-02. The Bison only competed in throwing events on the women’s side. Still, NDSU had five finishers in the top-10 in the shot put. Both teams will be back in action Thrusday through Saturday at the UC Riverside Spring Track Classic.